Croom Concrete’s pre-cast manholes, manhole rings, reinforced access covers and gully pot risers are growing in popularity in the field of civil engineering, and are proving their worth in safety and reduced labour costs. 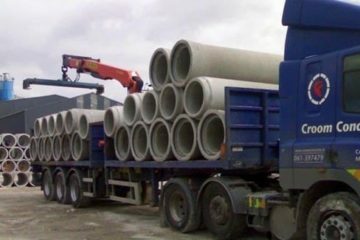 Croom can also supply ogee pipes in sizes ranging from 225 mm to 1500 mm. Where there is a need for safe access to drainage systems, Croom’s products will prove to be cost effective and simple to install. Road drainage, an area which is becoming more demanding with the increase in frequency in severe weather conditions, is a particularly important factor in the design of civil and commercial structures. Residential areas also need safe access to drainage systems, and reinforced access covers play an important part in the essential safety considerations of such applications. Croom’s manholes are simple to assemble and to install. Most of the work can be carried out by semi-skilled labour, thus reducing costs. The units are rigid under load. The manhole sections are supplied with steel coated steps, conforming to EN 131010:2002 Class C, and the steps are fitted during manufacture. This guarantees that there are no sharp edges, which reduces the risk of injury. They are coloured bright orange, so they are clearly visible, even in dark shafts. They are extremely durable, having a design life in excess of fifty years. A watertight seal may be created between each manhole section by the use of a suitable sealant. Croom’s precast concrete manhole rings are manufactured in diameter sizes of 900 mm, 1200 mm and 1500 mm. The available heights are 1 m, 0.75 m, 0.5 m and 0.25 m. The units are manufactured in a wide range of depths, allowing the creation of a modular system so all types of manhole depths may be accommodated. The units are manufactured with two 25 mm lifting holes (units should be stacked upright when being stored on site). Lifting the level of the drainage fittings is made simple with Croom’s precast concrete gully pot risers. The concrete seating rings are reinforced 65 mm deep units, which replace engineering bricks when adjustments need to be made to the level of ductile or cast-iron covers and frames. They are cheaper than engineering bricks, and quicker and simpler to install. They can be installed with semi-skilled labour, thus further reducing costs. These are a quality product, manufactured by a vibration casting process.